Puranpoli is a popular sweet dish of Maharashtra made during Holi, Ganesh Chaturthi and other festive occasions. 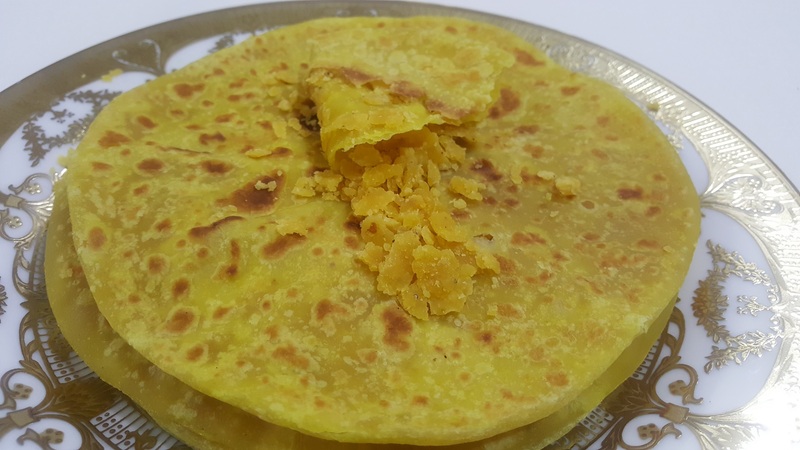 It is a flat bread stuffed with a filling made of split chickpeas and jaggery. Wash and soak 200 grams chana dal in water for around 2 to 3 hours. Open the pressure cooker after the steam escapes fully. Heat a pan. Add 1 tbsp ghee. Add the cooked dal. Cook the mixture while stirring continuously. If there are any whole dal left, mash them while stirring. Add cardamom powder and keep stirring until you get a thick and dry mixture. Keep this aside. In a mixing bowl or a plate, combine 2 cups of maida and 1 cup of wholewheat flour. Add salt, turmeric powder and 1 tbsp ghee. Add little water and knead to a smooth dough. Cover the dough and keep it aside for half an hour. To prepare the puran poli, divide the dough into medium sized balls. Divide the stuffing mixture into medium sized balls. Take a dough ball and stuff the puran inside it and bring all the edges of the dough ball together and seal it. Dust some flour on the rolling board and roll the stuffed dough ball into a circle. Heat a pan and cook the puran poli by drizzling some ghee. Cook till golden brown spots appear on both sides of the puran poli.